Start out with the stick, hose and the tape. 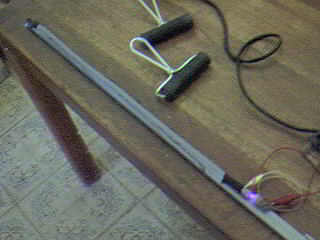 The stick should be about a yard or meter in length. The hose should be about 2 to 2 1/2 feet long. The surfaces of the hose and the stick should be clean so that the tape will adhere to them. Wipe the hose with an acetone moistened paper towel to remove any excessive wax or powder. Remove loose traces of saw dust from the stick by sticking tape and then stripping it off again. with a two inch length of tape. Next tie the other end of the hose to the stick. mild stretch to ensure that it lies straight. Covering the hose between the first and second bands of tape. two bands that hold down the hose. Although the colored rubber vegetable bands will work for a short time, those made from discarded bicycle tire tubes have far greater endurance of being run over by the brayers. the inlet end of the pump hose. submerged end of the hose. just on the stopped side of threshold. Operating the linear peristaltic air pump. 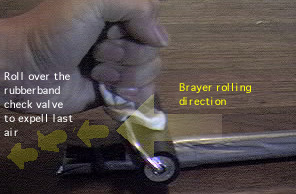 After connecting an experiment or a gage to the end of the pump, take a brayer in each hand. by Nyle Steiner did not have a check valve. immediately rush back into the experiment. This new design is forgiving to less than perfect operation. the valve to squeeze out the remaing air. Another view of my setup. a movie of the pump operation.